As officers attempted to contact the subject, he disobeyed their verbal commands and ran off the bus into the neighborhood. Officers started a foot pursuit of the subject, and then set up a perimeter as they lost a visual of the subject. 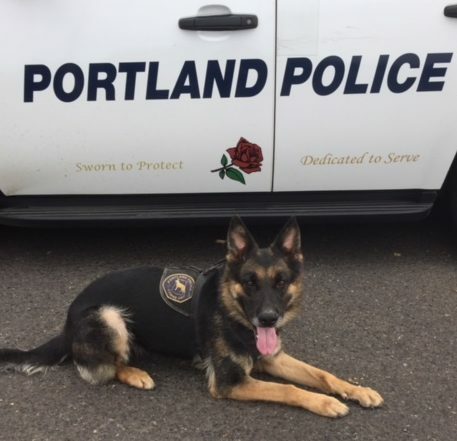 With the help of the Portland Police Canine Member “Utzi” and Air Support One, officers were able to locate the subject a few blocks away hiding in thick bushes. They placed the subject into custody without incident. The suspect was arrested and put in jail and is now facing charges of Theft in the Second Degree and Attempt to Elude on Foot. As for the bike? It was returned to the girl’s family. 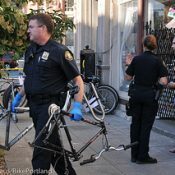 While any dramatic stolen bike rescue is worth sharing here on BikePortland, we still can’t get over the fact that the PPB deployed their Air Support Unit! 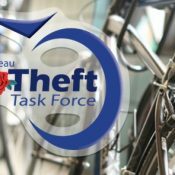 To track down a bike thief! 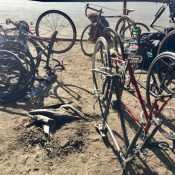 Bike thieves are the unholy descendents of Satan. But to steal a bike from a kid, reprehensible. 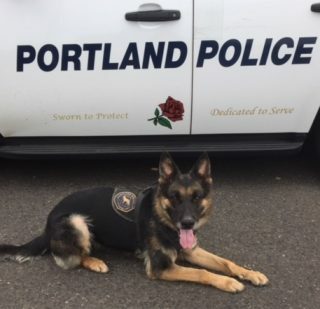 Thank you Portland Police ! Much like the arrest of Leroy Parsons, this makes me happy. To be fair, they deployed the air unit AFTER recovering the bike, so more about the disobeying Police orders and eluding than the bike theft itself. Cops “strongly dislike” non-compliance, to put it mildly. But glad they went the extra mile literally to return a child’s cherished bike (saw the TV news story and she was very happy to get it back). Fortunately they didn’t kill the suspect. Happens a lot these days. Escalation. yay, rah, sis, koom, bah! Boy, that was a great use of my tax dollars. So if you don’t want tax dollars used to catch thieves who steal from children, what exactly do you think is a good use of tax dollars? Our police force should ignore theft… Got it. you didn’t ask what our police should do; you asked how we should spend our tax dollars. I answered the question you asked, not the one you switched to. I certainly did ask whether tax dollars should be used to catch thieves and your reply did not mention it so I assumed you did not think that local policing to catch criminals who steal (mostly from poor people) was a good use of tax dollars. I am sorry the kid had her bike stolen. I am glad she got her bike back. I am relieved that the suspect get his day in court. I am also upset that it took a K9 and a helicopter to do it. I also do not find giddy joy in the criminals being caught and fantasize about punishing them. I surely do not wish undue violence toward the suspect by police, human or dog. All those things can be true. Personally, I rather enjoy it when criminals get caught. What should happen after the suspected criminals are caught? What should happen when criminals are convicted? What should happen to that criminal after he has paid his debt to society? Would you show up to a public flogging? Would you find that enjoyable? Also a fluke, I’d venture. For every one hundred (one thousand?) reported stolen bikes in this town we get one of these action sequences? I’m kind of sorry the thief did not resist arrest. Did you enjoy the footage from Abu Graib? You can always watch attack dogs being sicced on water protectors in N Dakota on youtube. Your false equivalency dilutes your own arguments. When everything is a humanitarian crisis and incursion into civil liberties, then nothing is. And no one will listen to you when the autocracy truly takes over. hundreds of thousands of dollars frittered away on a petty theft when portland residents are freezing to death due to being evicted from their housing. My concern is for the (potential) child on the other end of this incident. I’d like to see a follow-up to ensure there isn’t a neglected child at the suspect’s home who might need help…, or at a minimum, needs a new bike and safety gear! I’m impressed. I hadn’t thought of that. My mental image was just someone taking a bike to trade for drugs. It didn’t occur to me that this might be a desperate act to secure the trappings of a more normal childhood for his child. I wonder if we will be treated to a bit of follow-up that might reveal why this individual stole a child’s bike. I’m closing comments on this post until I have more time to moderate them. I’ll consider reopening them Tuesday morning. I hope you understand.